The Grand Theatre treated patrons to a special holiday double feature last Thursday, Friday and Saturday. 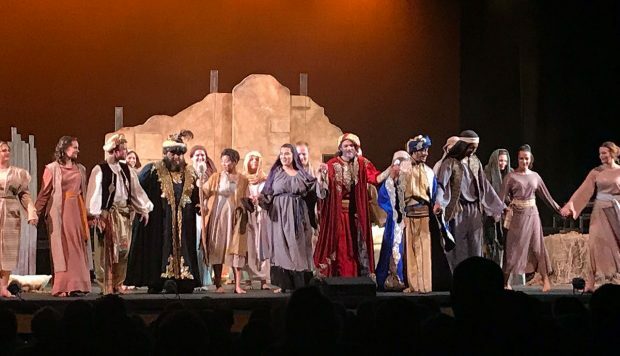 Partnering with the Lyric Opera Ensemble from the University of Utah School of Music, Sinfonia Salt Lake, and the Salt Lake Symphony, “Amahl and the Night Visitors & A Christmas Carol” delivered two classically lighthearted operettas in one exciting evening. “Amahl and the Night Visitors” tells the story of a poor disabled boy with a bad habit of telling lies. One night, he and his mother are visited by three kings looking for a place to rest on their way to see the birth of Christ. Amahl’s altruistic character impresses the kings and an unexpected adventure emerges. This piece displays a universal interpretation of the Christmas holiday, the events dated back to the story we all know but with a touching perspective on the other people of that time. Amahl and his mother’s misfortunes shed a light on the needy people we keep in mind today. Throughout their trials and tribulations, Amahl remains selfless and the Kings recognize and admire this. They make the choice to give which reminds us of the true meaning of Christmas. “I think it does a great job of centering our thoughts of why we celebrate Christmas, and the power that that can have can be really powerful on people,” says Jordan Tolman, who plays King Kaspar. “Amahl and the Night Visitors” is originally composed by Gian Carlo Menotti. Despite Menotti’s wishes, Alyssa Liu as Amahl gave a remarkable performance. Act two is an operetta adaptation of “A Christmas Carol” based from the beloved novella written by Charles Dickens. The adaptation is written by University of Utah students Mike Leavitt and Anthony Buck. “A Christmas Carol” is a story we all know but revisit each year for the heartfelt message. Ebenezer Scrooge holds a firm, pessimistic idea of Christmas; ungrateful for his wealth, he is visited by his past, present, and future on Christmas Eve. He is awakened and a change of heart transpires, bringing joy to those around him. In this adaptation operetta, you see more of the interaction with Scrooge and the other characters than the original which gives for a more well-rounded image of the antihero making the piece all the more entertaining and at times somewhat relatable. Two alternative dual operettas, both family friendly and a truly unique experience to the conventional Christmas stories but enough tradition to feel comforted in the stories we all love.